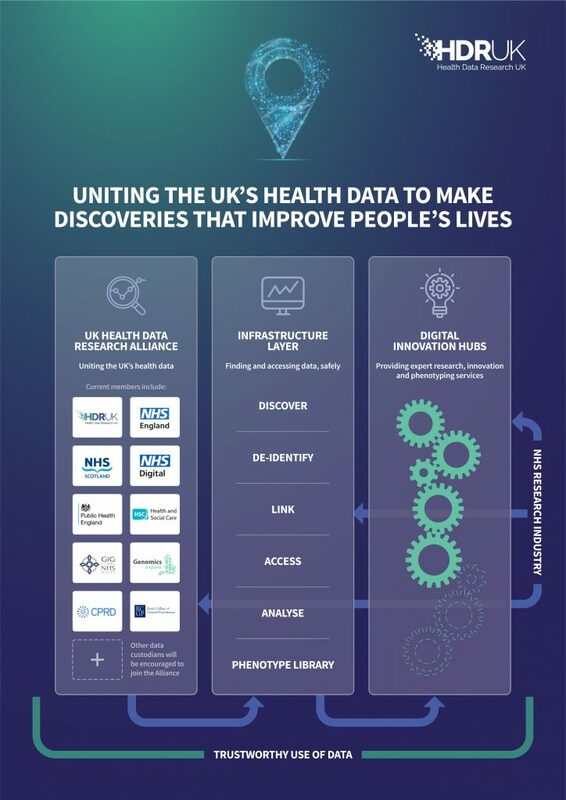 The Digital Innovation Hub Programme aims to enable a UK-wide life sciences ecosystem that provides access to health data, technology and science, research and innovation services to ask and answer important health and care questions. This four-year Programme is funded by the UK Research and Innovation’s Industrial Strategy Challenge Fund (ISCF). It is an element of the ISCF’s Data to Early Diagnosis and Precision Medicine challenge, placing early diagnosis and best treatments for particular patients at the heart of a national approach to better health. It builds on many recent healthcare technological advances, including in digital health and genomics, and on broader developments in machine learning and artificial intelligence. These three functions form the emerging model of the Digital Innovation Hub Programme and are explained in detail in our discussion paper, published in March 2019. This paper aims to stimulate discussion and feedback in advance of the publication of the final Digital Innovation Hub prospectus in May 2019. We are working in partnership with a wide range of organisations across healthcare, academia, industry, charities and patients and the public to develop the design of the different components of the programme. The conclusion of this collaborative endeavor will be published in a prospectus in May 2019. Find out about our Digital Innovation Hub Programme events here. Ten projects have been funded as Sprint Exemplars. These have been selected to provide “confidence in concept” of potential technology solutions, and proof of readiness for industry innovation use cases. The exemplars are being delivered by academic, NHS and industry consortia with funding in the order of £300,000 each. You can find out more about the successful projects, how they were selected, and the timescales for completion here. A staged delivery plan will be launched in May 2019. Further details of the approach to implementation, including calls and invitations to tender will be published as they are agreed. Make sure you have registered your interest to stay updated.